We are a leading Manufacturer of ribbon blender from Ahmedabad, India. 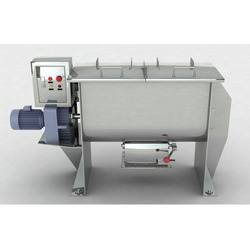 We are among the prominent players in the industry for manufacturing Ribbon Blender. The offered ribbon blender is made in tune with the industry standards and has earned us loads of profits. This blender is effective in mixing powders and granules in chemical, cosmetic, pharmaceutical, dyes and food processing industries.